So what if you’ve created a compelling petition and collected signatures, but your decision maker won’t budge? It’s time to use your power to build momentum for change. Start by understanding what your decision maker cares about and what is most likely to influence them. Then engage your supporters to take action together to influence them. That way you can put pressure on your decision maker to act. How does your decision maker want people to see them? Whose opinion does your decision maker care about? What news headline or celebrity statement would make them furious? Who are their donors or funders? Who lends them money or invests in their business? Who are their customers, constituents, suppliers, and workers? Who appointed them and can replace them? Who has the power to direct them to make a change? Whose support do they rely on to continue in their position? Once you know what your decision maker cares about, you can plan tactics to engage your supporters to help you win. Start with actions and asks for your petition signers that are simple and easy for them to do. As your campaign gains momentum you can ask signers to take actions that are more challenging, and can have more impact. As your signers learn more about your campaign and become more invested, they will be willing to do more to help. Plan an outdoor rally in summer, rather than winter - or check the weather forecast for the week ahead! Don’t be afraid to adjust your plan to take advantage of unexpected opportunities too. For example, a big news story related to your petition or a response by your decision maker are great moments to ask your signers to take action. Be ready to act quickly if an opportunity comes up. The petition update tool is an important tool that you can use to ask signers to take action on your petition. The types of tactics that you can use are limited only by your imagination, but here are some ideas to get you started. Supporters of a petition to ALDI Australia calling for the supermarket to stop selling eggs from caged hens bombarded the ALDI facebook page with their outrage over its practices, the posts even generated media coverage of this consumer backlash. Women's Health Magazine asked supporters to tweet at celebrities to request they share the magazine's petition for paid parental leave. Morenike Giwa Onaiwu started a petition to drop a prosecution against a six year old autistic boy. Ahead of his trial Morenike asked signers to share messages of support. “Hi Kayleb! You must be pretty upset with everything that's happened. I promise you your family is fighting for you and so are the THOUSANDS of us who love and care about YOU! 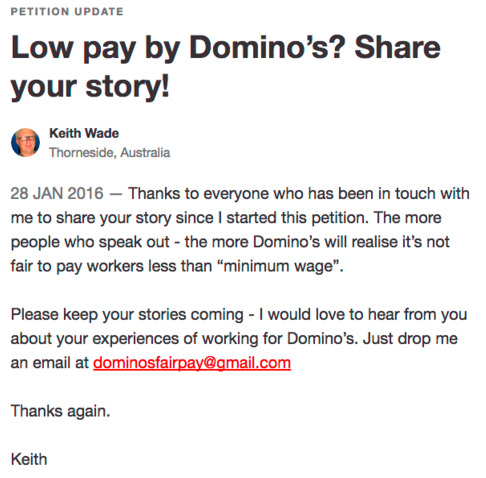 Love and God bless - Helen"
Keith Wade asked signers of his petition to Domino’s to start paying its pizza delivery drivers minimum wage to share their stories of low pay and mistreatment at the company, to help support his case. Lots of young, overworked and underpaid former and current employees shared their stories of worker exploitation. 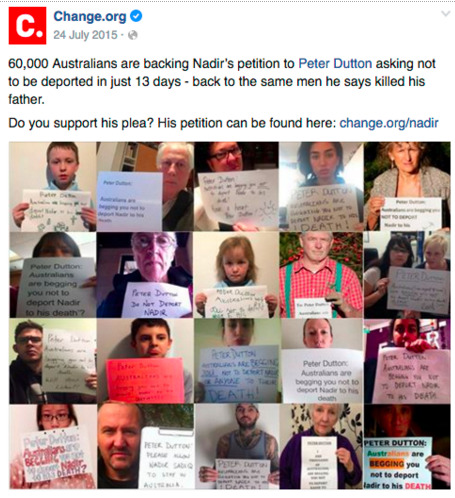 When Nadir faced deportation back to Afghanistan, where his father was killed and he faced the same fate, signers of his petition shared photos of their support for Nadir - asking for the Immigration Minister to grant his visa. 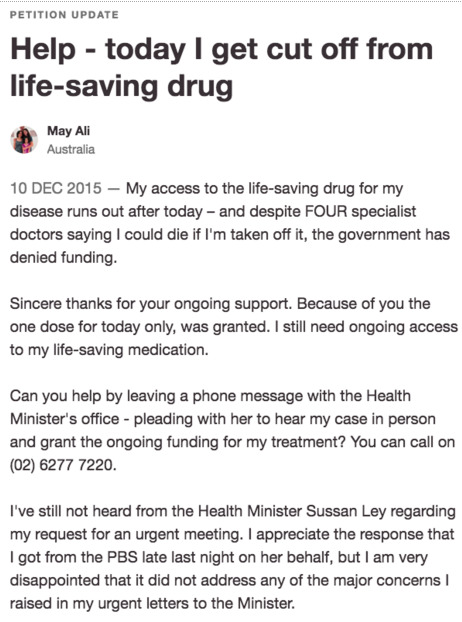 When May Ali had funding for the medication keeping her alive cut by the Federal Government, May called the Health Minister’s office pleading for funding to be reinstated. She asked signers of her petition to do the same, the Health Minister announced her access to the medicine was granted. Dani Keogh, a victim of domestic abuse, garnered the support of over 60,000 signatures on her petition calling on the Government to close the loopholes that stopped her from fleeing her abuser, and was invited to deliver her petition to the Queensland Minister for Women. She attended the delivery with a supporter of her petition, who reached out after having a similar experience. Omotayo Richmond asked his signers to attend a school board hearing to rename a High School in Jacksonville, FL named after the founder of the Ku Klux Klan. Klaus Bartosch delivered his petition to Jetstar to end the credit card surcharges complete with a gigantic paper aeroplane - featuring the number of signatures he’d collected on his petition.